Ah, quantum mechanics, inscrutable and stupendous way of doing physics and yet, no-one knows why it works. I have always been amazed by the wonders of quantum world and always looked for the ways of grasping its significance. One really illustrative example of the quantum phenomena is called a finite square well, and here I present my solution of this popular problem solved in the numerical computation package of Python. Finite square well, what does it mean? Actually it’s quite simple to comprehend – a finite square well is a one-dimensional function V(x) which has a constant value V0 everywhere except where |x| < L, when it drops to zero (Figure). V(x) is called the potential function and it determines behavior of the quantum particle. Don’t be afraid now- even though quantum physics was designed to accommodate subatomic particles, you don’t need to know particle physics to understand this post. Quantum theory works well even if you imagine normal everyday objects like footballs, cars or rabbits instead of protons and electrons. The idea is that particle is bounded within the region -L<x<L, and does not have enough energy to leave it. This is called a bound state. Classical interpretation would be a tiny ball in the box bouncing back and forth from two sides, forever. What sense does it make? Well, in school grade physics you learned that higher the position of the body, bigger is its potential energy. So, top of the mountain”contains” higher potential than the mountain’s bottom. If there was car between two mountains it would be forever stuck in the valley between if it’s engine cannot make more (kinetic) energy than it is potential at the top of the mountains. Note: this is time-independent form of the Schrödinger equation, and it will give us a time-independent solutions of . But don’t worry, time-independent solutions are very insightful and – now comes the best part – complete solution is just a linear combination of time-independent solutions! To make long story short – to describe the behavior of the particle, just give me the Schrödinger equation and the potential function and I will tell you all you want to know about the particle. As you see, problem includes differential equation and it’s solution may be tricky if you are a fan of “pen and paper” approach. But, there are people out there who made computers do all this dirty work, and some of these tools are available in our beloved Python. The one I will use is a routine called odeint() (which stands for ordinary differential equation-something) and is included in standard scipy.integrate package. The odeint() works in a two-state-space representation of : state one is function the way we want it and state two is a first derivative of . The thing is – this way we can get infinitely many solutions. But not all of them are meaningful. We need to find only those solutions where does not diverge at the edges of x. If it diverges, it disobeys the condition of square-integrability: and we deal with the physical falseness. 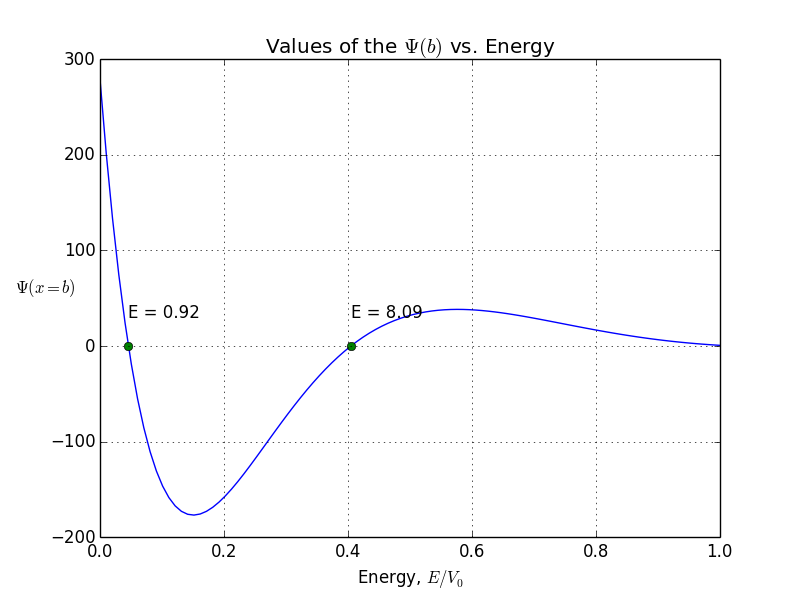 So here’s what we do: we run value of particle’s energy E from 0 to some value, say Vo, and calculate for each E. Value of (at the far outside of the finite well – where b>>L), is put into the separate list whose roots (places where it crosses zero) are to be found. Only those energies E for which is zero are taken in consideration and represent valid state of the particle. Here we see first of many weird things happening in the quantum world – particle can not have any value for kinetic energy, only some of discrete numbers. Returns derivatives for the 1D schrodinger eq. (Note: I’ve put m so that , just for simplicity). This function prepares state-space only. Following function does the real job, calls the state-space function and calculates the wave function for a given energy E. It also returns value of at the location x=b to test divergence. In this example, I put V0 to 20, L to 1, and m so that . We obtain only 4 four allowed bound states with energies 0.92, 3.65, 8.09, and 14. Now there’s a little trick. You remember that fantastic little function which solves differential equations, odeint(), needs some initial conditions to work, right?. These are the values of at x=0. What we get from it is the function only right from 0! What happens on the left side? It depends on how we set the initial conditions. For if we chose and we get something called symmetrical case, so left side is just mirrored right side. But if we reverse initial conditions so that and , we get antisymmetric case. Why is that so? I’ll tell you just that symmetrical states correspond to the cosine based functions, while antisymmetric correspond to the sine based functions. More about it will come a bit later. This is nice and correct way to solve the problem of the finite square well. But, I don’t like this boring pictures, so I decided to cheat a little bit :). You see, the odeint() requires the initial conditions at x = 0, assuming x goes from 0 to b. But what if I give it values -b < x< b? Normally, we expect to be o. But if we put initial conditions to be zero, we won’t get any non-zero result. That’s how the odeint() works, I can not prevent it. So here is where I cheat: I put x to be from -b to b, but initial conditions are not zero. Instead, they are some arbitrarily small value. Of course, odeint() will mess up values, but, interestingly, the shape of the function will stay correct! Additionally, it will calculate both symmetrical and antisymmetrical states. Great! As said earlier, values are messed up, since the integral of squared is not 1. But it doesn’t matter cause is normalized anyway later. Few things about these states. Particle exists only in discrete states and is associated with the corresponding energy in each state. The states are orthonormal. One state can not be represented as a linear combination of other states. So, the particle can not be in the state which is not representable as a combination of given states. Probability of finding particle in space is integral of . We see that in the first state (ground state) most likely to find the particle is in the center of the well. But if you give the particle a bit of energy and it jumps into the second state (excited state) you will find it most likely between center and edges. What happens with the particle behind the walls of the well? 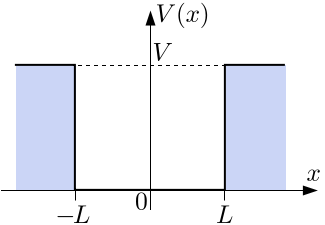 We see that is not zero left from -L and right from L. It means that there is a non-zero probability of finding a particle outside the well! Remember the analogy with the car between the mountains? It would mean that car has somehow ended behind the mountain although it can not climb it. The phenomenon is called quantum tunnelling and it may seem crazy in case of a car and a mountain, but it is quite common and normal thing in subatomic particles. print "Energies from the analytical model are: "
1D Schrödinger Equation in a finite square well. in a given range of energies and plot wave function for each state. tool &amp;amp;amp;quot;brentq&amp;amp;amp;quot; to find the root of the function. Both tools are included in the Scipy module. at the value b far outside of the square well, so we can estimate convergence of the wave function. - find_all_zeroes(x,y) finds the x values where y(x) = 0 using &amp;amp;amp;quot;brentq&amp;amp;amp;quot; tool. 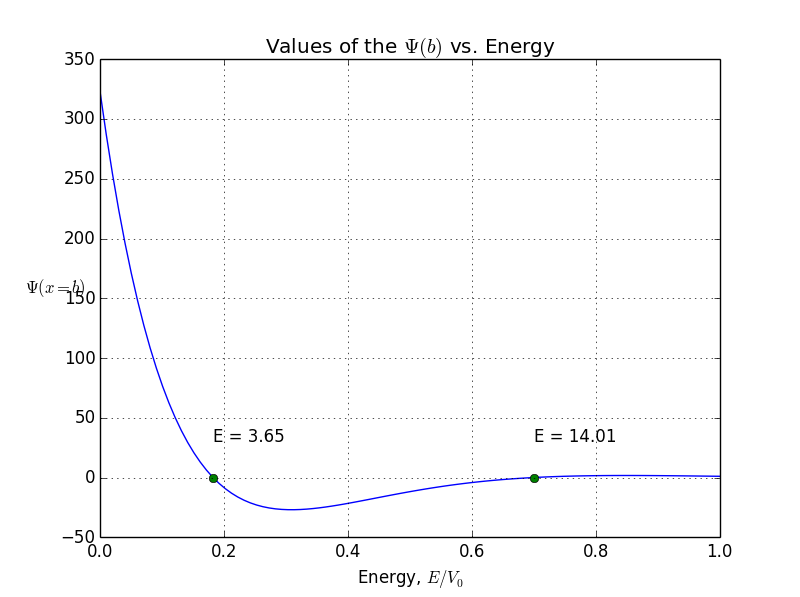 Values of m and L are taken so that h-bar^2/m*L^2 is 1.
energies computed by the program are printed and compared with those gained by the previous program. 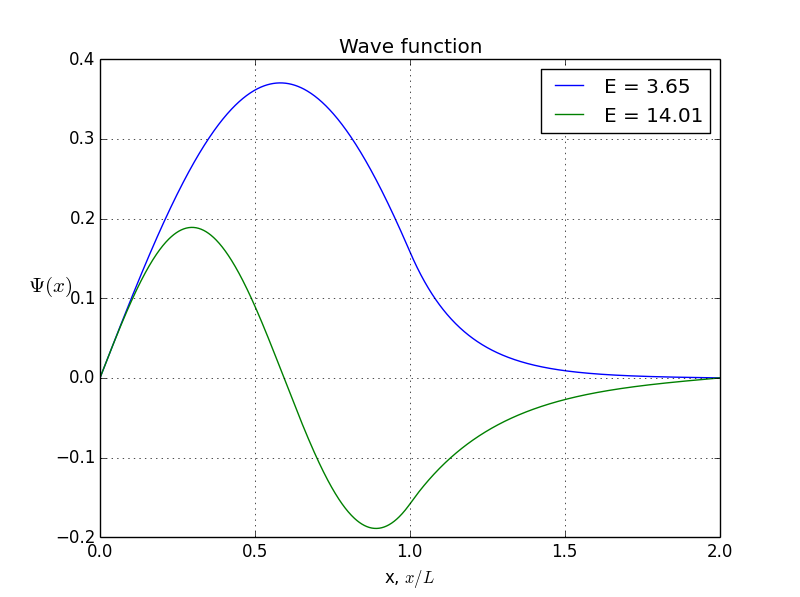 wave function psi, and state1 is its second derivative. print "Energies from the analyitical model are: "
E = 0.0                   # global variable Energy  needed for Sch.Eq, changed in function "Wave function"
print "Energies for the bound states are: "
Thanks, I’m glad that you liked it! Next, you can play with Qutip (http://qutip.org/). I just executed your 1DSE for finite Sq Well and it gave two nice plots. 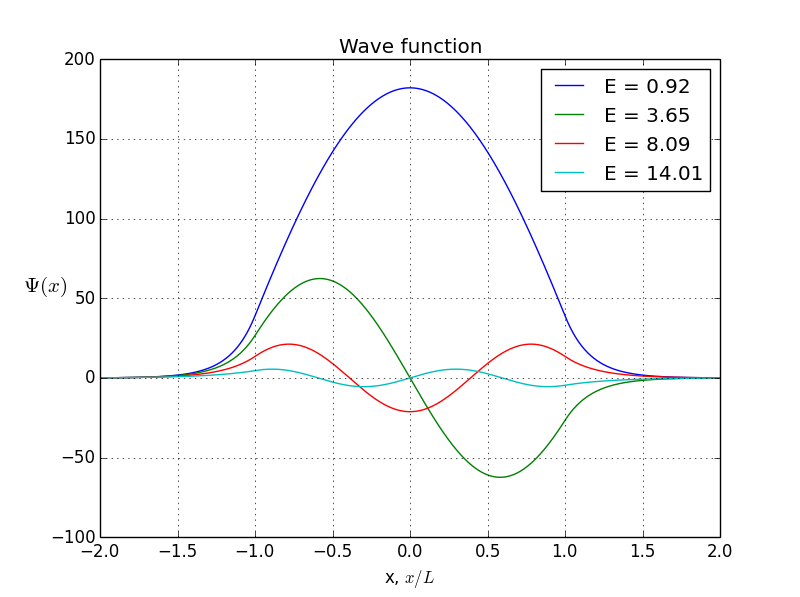 The 2nd plot titled “wave function” should be renamed “probability density, \Psi(x)^2”. Overall a nice effoet. Keep going. Thanks for the feedback! You’re right, I forgot that I changed the code before updating post! Wow, I wanna revise Quantum Mechanics now! Thanks, I’m glad you like it. Keep on rockin’! by the brentq() procedure. I failed to get it even with setting b = 3 and Nsteps to 3000. Thanks for the reply, Anandaram, I am happy to see that my post interests you so much! Regarding your question, I tested the program and this is my conclusion: brentq() fails to find last energy level because odeint() doesn’t give solution which drops so fast at b! 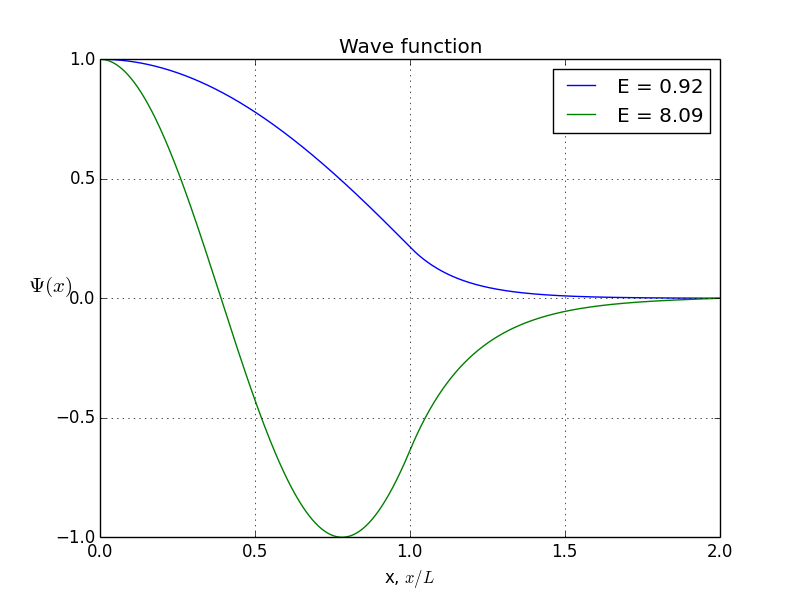 This is because of relatively small potential V0 – the smaller V0, the wave function lives longer outside the well, and program can not find its exact zero-value. Solution to this problem? Increase V0 or b! 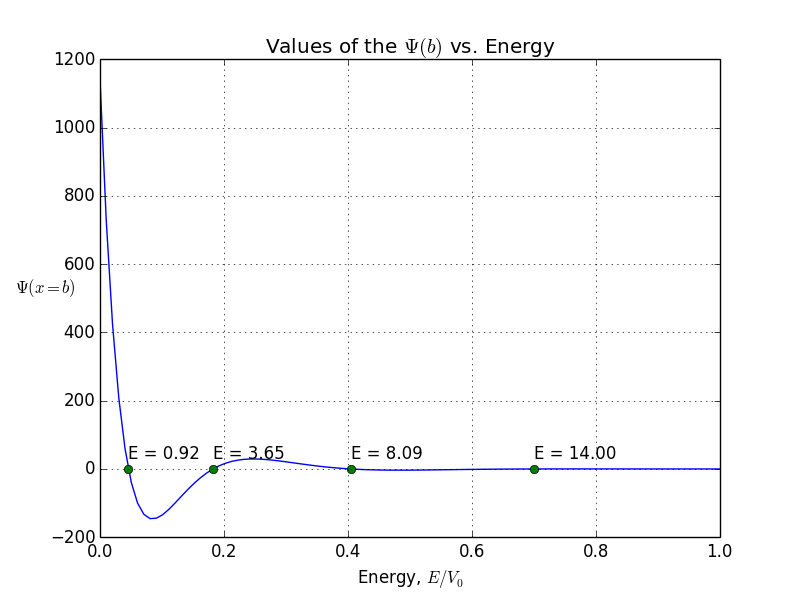 Than the numerical values of energies will give you exact energies from analytic model! Thanks for your advice. The problem rarely recurs when Vo is increased keeping b = 3.
program to the case of Vo = Inf. It didn’t work. Then I set b = L = 1 itself with Vo = 50(say). How to extend this to a 2D particle-in-a-box ? running the software I get the equation solution in the terminal but not the plots…I’m using qutip ..
/usr/lib/pymodules/python2.7/matplotlib/axes.py:4747: UserWarning: No labeled objects found. Use label=’…’ kwarg on individual plots. what do you mean, you’re using qtip? If you run my code on the python supporting platform, there should be no error messages. I mean that I have used the Qutip (http://qutip.org/)platform….but it doesn’t matter.. Using the platform you have used I get the numeric solutions but not the plots. It’s surely my fault but I do not know where I made mistake! sorry, for some reason I can not answer your latest post, so I’ll write here. Are you sure that all your modules are installed in proper version? Maybe you’re using Python 3? thanks for your reply and thanks for your patience! The system is MAC..but the same I have in Linus Ubuntu..
AS you can see I have put in a terminal the calls to the libraries and I do not get errors…..
You can be so kind to tell me what python have you used and all the libraries you have used?..it can solve the problem since I will follow step by step everything. everything seems fine, judging from your latest post. I used also Python 2.7 in Spyder software tool on Win 7. Sorry, but I honestly have no idea for what may cause your problems. Try to run the program on some windows computer. If it works it must have been some Mac/Linux incopatibility issue. I had the same mistake, are you corrected? Try this..and i hope it will help. I am reading such posts of animation of quantum mechanics equations using python. I want to learn it. May I know the minimum requirement of tools. Mathematics, python relation files etc and their combination to use. I have basic python only. and I know a bit of that only. Please suggest stepwise and I will try to learn. Hello Sachin. To learn Python I used many online resources and tutorials. There are multiple blogs and online courses that teach you, this one in.e. http://openedx.seas.gwu.edu/courses/GW/MAE6286/2014_fall/info I started with Python many years ago with simple book “Python for dummies”. I found a mistake in your code, the potential is inverted, you have a wall instead of a well. Though I disagree, thank you for your opinion. Could you point out more precisely what error did you find? This is what you have in the code above, but if you look at it carefully, it shows that its a wall. When I run the code as is, I do not get any bound solutions numerically. If I switch 0 and Vo, then I get all the same plots you have shown in the blog post. How to calculate energy states and w.functions in multilayer quantum wells?